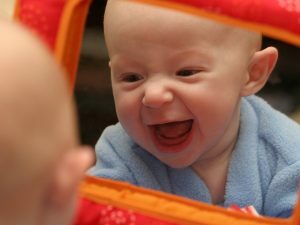 While infants share developmental milestones, each infant is unique. Our room is designed to meet the needs of each individual child’s development. Much of the day is spent following your infant’s growing desires and curiosity as well as their emergent needs and interests. We provide a variety of developmentally stimulating and challenging activities to spark your baby’s interests and encourage their growth. As part of their development they are exploring the world around them through their senses; sight, smell, touch and of course taste. We incorporate activities, songs, and books that will promote their physical, intellectual, emotional and social development. Infants need safe spaces to grow and learn, at home and away from home. When your infant is in our care, we are committed to providing a nurturing and caring environment that meets your needs and the needs of your child. As your infant grows and changes – which happens on a daily basis at this stage – we make changes, too, so development and learning unfolds naturally. We are delighted to share these moments with you as your child discovers the world around them.